It literally feels like forever since I have written a post for you guys - but I'm back! 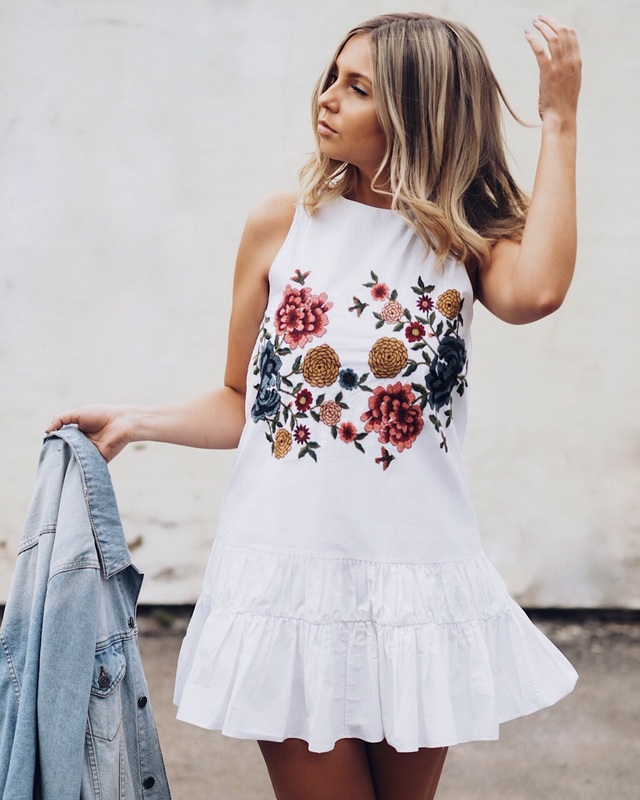 What better way to make a blogging comeback than with this BEAUT of a dress!? If you read my posts regularly or follow me on Instagram, you probably hear me say "I am so obsessed" with a lot of things, but I literally really am SO OBSESSED with this dress. Now there are three things that made me fall instantaneously in love with this dress. Numero 1; the fit. It is such a cute and flattering fit. I usually struggle with drop waist styles as my hips are probably (definitely) the larger part of me, but I didn't at all with the ruffle on this dress which just made me so incredibly happy. My second is the embroidery. So in my last post I talked pretty heavily about embroidery and how I am loving it this spring - but this is next level! The colours on this embroidery are seriously fantastic. It means you can pull pretty much any colour accessories into the look. I went for red, but I am definitely going to bring tan, black, and maybe even gold into this look at some point. Reason three? IT WAS UNDER £30. Yep. That is not a joke. It is one of those dresses that I will be throwing on at any given moment...day or night. So when I saw that it was just under £30, I almost cried. Ok I didn't cry but the time between me picking it up and heading to the checkout was sub-second. At the moment I am very much aware that festival season is looming, and in fact I will be at Glasto next month! So last year was my first ever proper Glastonbury and this year I am feeling pretty confident about what to expect and what to wear. I have made a few purchases recently ready for Glasto and I can't wait to show you all (posts to come - don't worry). This dress is probably going to be first in the bag, which just shows how versatile it really is as I can flip between strappy heels to wellies in a heartbeat! It may not stay this white for long though..sorry Mum. This dress and sandal combo has also really got me thinking about summer holiday locations. I have nothing booked at the moment which is SO unlike me. It feels weird to not have some adventure planned, big or small. This dress would look even better with a tan (and a cocktail and a beach sunset - but maybe I'm biased?) so with this in mind, my aim over the next couple of weeks is to get a jolly booked. My Sister has just moved to Milan so I cannot wait to get there to her. Then Santorini seems to also be calling my name. IMAGINE this dress with the whitewashed buildings there?? I would love to know where you guys are heading off to this year? Inspire me! And will you be taking this dress of dreams with you?? My suggestion is absolutely yes!!! I am very impressed by this site and really going to share this site to my friends. It's a really useful post for summer dresses. best options for summer dresses such as: kurtis, tops, etc. And So cool your style i really like your style and your post. thanks for sharing his nice post. Preakness week programming starts Wednesday, May 16, with an uncommon Maryland Horse Industry Spotlight Show at 4:00 p.m. ET, trailed by live inclusion of the Preakness Post-Position Draw at 5:00 p.m. ET. The two shows are supported by the Breeders Cup 2018 Live Stream Maryland Horse Breeders' Association and can be heard on Sirius 219/XM 201 and spilling live on the HRRN site, www.horseracingradio.net. HRRN returns Friday, May 19 at 3:00 p.m. ET with their prevalent Xpressbet Radio show covering the memorable Black-Eyed Susan Stakes (G2) and undercard races. "The Big An" Anthony Stabile has the show which pretense across the nation on Sirius 219/XM 201 with live gushing accessible on the HRRN site. The Equine Forum displayed by FarmPaint.com commences HRRN's Preakness Day inclusion on Saturday morning. Host Mike Penna will be joined by unique visitors to see the Preakness Stakes. Audience members can tune in from 8:00-10:00 a.m. ET on Sirius 219/XM 201 alongside earthly offshoots the nation over and on the HRRN site. The angry Queensland pure breed industry is undermining strike activity on Melbourne Cup and Cox Plate days as it believes it has been dealt with horrendously with an ongoing state government purpose of utilization impose declaration. Brisbane's The Courier-Mail daily paper has detailed the sensational move, which includes a letter being sent to Queensland Premier Annastacia Palaszczuk uncovering the aim to remain down all industry members from gatherings at Doomben, Gold Coast and Toowoomba on Cox Plate Day October 27, and again on Tuesday November 6, Melbourne Cup 2018 Live. The letter has the support of the Queensland part of the Australian Trainers Association, the Queensland Jockeys Association, Queensland Racehorse Owners Association and Queensland Thoroughbred Breeders. You are so pretty and your dress,shoes everything is just wow.